Caitlin grew up in Radford, Virginia and Greenville, North Carolina. She studied Environmental Science and Geography at the University of North Carolina Chapel Hill. In 2017, Caitlin traveled to Peru, Bolivia, Spain, and Mexico to observe informal food markets and WWOOF on rural farms as part of a travel scholarship from UNC. 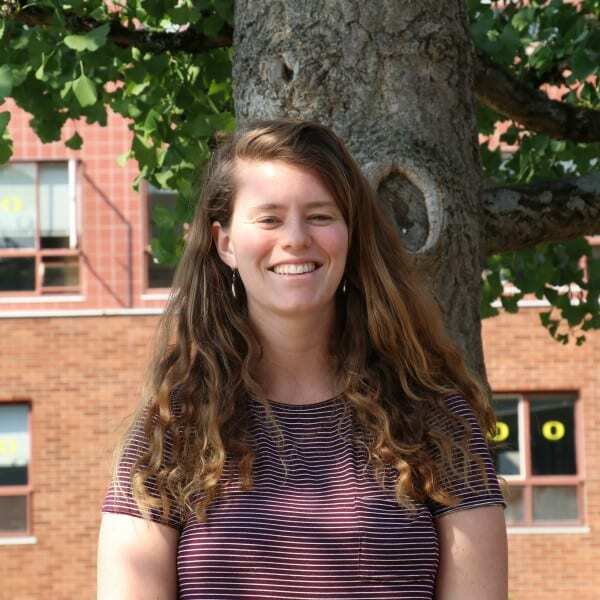 She is beyond excited to learn and grow in the RARE program, in her position at the Food Bank, and as a new resident in the Columbia River Gorge. The Columbia Gorge Food Bank (CGFB) is a transitional program of the Oregon Food Bank that supports hunger relief partners in Wasco, Hood River and Sherman counties. These counties are home to many orchards, wheat fields, and ranches, as well as an array of recreational opportunities and tourism. CGFB sources and receives donations from grocery stores, local orchards, farmers, and food drives. It currently serves 17 hunger relief partners at 23 sites reaching approximately 3,300 people each month. The food bank is developing new pantries in rural areas and supporting food security efforts throughout the Columbia Gorge. RARE member Caitlin Seyfried will work as Community Outreach Coordinator at CGFB under the mentorship of Sharon Thornberry. Her work will primarily involve community food systems organizing to identify food- insecure rural and underserved communities in Sherman, Wasco, and Hood River counties. This includes frontier areas, Native fishing villages, Latino, farmworker, Samoan, unhoused, rural, and senior communities. Current food bank programming will be evaluated and new efforts will be developed in collaboration with food-insecure communities. The project will conclude with a report on underserved areas, current and potential community based solutions, and future opportunities. Caitlin will develop a volunteer program for CGFB and its Partner Agencies, assess the volunteer capacity and needs of Partner Agencies, and support the development of a disaster plan for CGFB and Partner Agencies.